BANGKOK (AP) Asian stock markets fell Monday as investors braced for the possible phaseout of a US central bank stimulus program that has boosted stock prices worldwide. Traders are refraining from big moves as they await the release of the minutes from the Federal Reserve�s July policy meeting for hints of whether and when the bank will begin cutting back on its monthly bond purchases. The focus will remain on the Fed on Thursday, when it starts its annual conference in Jackson Hole, Wyoming. "The volatility these two events could cause to markets could see bond yields overshooting fair value, and equity markets logging five and six day losing streaks," said Evan Lucas of IG in Melbourne, Australia. Japan�s Nikkei 225 index fell 0.5 percent to 13,684.60. 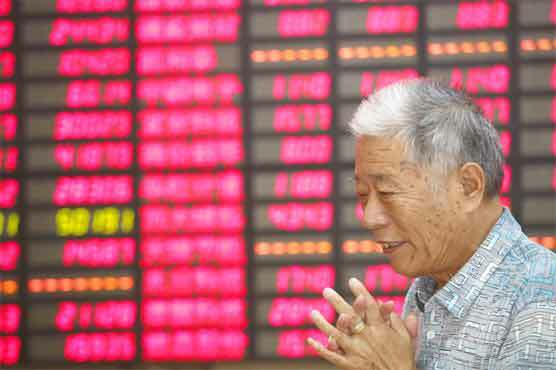 Hong Kong�s Hang Seng dropped 0.3 percent to 22,389.06. Australia�s S&P/ASX 200 lost 0.5 percent to 5,085. South Korea�s Kospi rose 0.2 percent to 1,919.96. Recent economic data and public statements by Fed policymakers have led to expectations that the Fed might begin winding down its $85 billion a month in asset purchases next month. That would decrease the demand for bonds, lowering their prices and raising their yields. Rising yields in the U.S. have already sparked jitters among Wall Street investors as they fear higher lending costs could stifle economic recovery. Stocks fell Monday as investors continued to sell bonds, pushing yields to multi-year highs. The yield on the 10-year Treasury note rose to 2.88 percent, the highest since July 2011. The Dow Jones industrial average fell 0.5 percent to close Monday at 15,010.74. The Standard & Poor�s 500 dropped 0.6 percent, to 1,646.06. The Nasdaq composite fell 0.4 percent to 3,589.09. Meanwhile, the deficit in India�s current account a broad measure of its trade and investment transactions with the rest of the world has been garnering attention following a nearly 5.6 percent drop in the country�s benchmark Sensex index since Friday. The current account deficit widened to 4.4 percent of gross domestic production in the second quarter of 2013, analysts said, as exports slumped due to weaker commodity prices and imports rose on the back of rising fuel and other costs. "The current account may remain in a structural deficit and persist for longer, unless commodity prices and demand recover more significantly," said analysts at Bank of America Merrill Lynch in a commentary. Analysts at Credit Agricole CIB in Hong Kong called India "vulnerable," and noted that Moody�s decision to maintain a stable outlook on India�s credit rating "is unlikely to change pressure on its assets." Benchmark oil for September delivery was down 4 cents at $107.06 per barrel in electronic trading on the New York Mercantile Exchange. The contract closed down 36 cents to $107.10 on the Nymex on Monday. In currencies, the dollar rose to 97.77 yen from 97.62 yen late Monday. The euro was unchanged at $1.3333.